The Santa Clara County jail system continues to be at the center of turmoil. Sources told NBC Bay Area the current president of the embattled jail officers union, Lance Scimeca, has stepped down temporarily in the midst of numerous investigations of the jail operation and officer conduct. 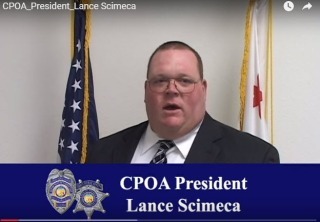 Members of the Santa Clara County Correctional Peace Officers’ Association said they were told of Scimeca's decision at a heated union meeting Tuesday night and no vote was needed. They said the union vice president and other union officers will assume day-to-day leadership until further notice. Although the sheriff's department will not comment on Scimeca's status, sources told NBC Bay Area the officers are being investigated for exchanging, what were called, "racist" text messages mainly about inmates. The Mercury News recently reported that other officers are also part of a probe concerning "racist" and possibly "threatening" text messages. Numerous groups including the local NAACP and civil rights advocate Silicon Valley De-Bug say the alleged text messages show a "culture of hate" in the jail and have called for state and federal involvement. Scimeca was at the center of this outcry, as he allegedly sent anti-Jewish texts, according to the Mercury News. The county has hired a consultant to evaluate the jail operation and a county-appointed Blue Ribbon Commission is also investigating the jail system. The jail operation has come under intense scrutiny after three correctional officers were arrested and charged with murder for the alleged beating death of inmate Michael Tyree in August. The deputies pleaded not guilty on Tuesday.